Aims: Spinal hypotension using conventional local anesthetic doses for elective cesarean delivery (CD) has been associated with fetal acidosis. The optimum anesthetic technique for laboring women with nonreassuring fetal heart trace (FHR) and its effects on neonatal outcome has not been well studied. Materials and Methods: Thirty laboring parturients with a nonreassuring FHR undergoing emergency CD (category 2) were included in this study. The parturients were randomized to receive a low-dose spinal anesthesia (LDSA group) 8 mg hyperbaric 0.5% bupivacaine with 20 μg fentanyl, or standard general anesthesia (GA group). Systolic blood pressure was maintained at >100 mmHg till delivery of the fetus using phenylepherine boluses. The primary outcome variable was cord blood gas base excess >8 meq/L. Statistical Analysis: Assuming an SD of 7.5 and difference of 5 as clinically significant difference in base deficit, we required 15 patients in each group with α of 0.05 and power of 90%. Student's t test, two-way repeated measures analysis of variance (ANOVA) and Chi square test were used to analyze the data. Results: The incidence of fetal acidosis was higher in the GA group. Lower APGAR scores at 1 and 5 min and a greater need for immediate resuscitation was observed in fetuses exposed to GA. All patients in the LDSA group achieved adequate surgical block as well as stable hemodynamics. No adverse event was observed with either of the techniques. Conclusion: A LDSA is associated with better neonatal outcome in women with nonreassuring FHR as compared with GA. The choice of anesthesia remains undoubtedly single shot spinal anesthesia (SA) during caesarean delivery (CD) when there is no immediate threat to the life of the woman or fetus. SA is believed to be simple, effective, safe for the mother and usually can be instituted within 10-20 min. But, lately, it has been questioned whether it is safe for the babies too? Several reports have shown that SA tends to produce fetal acidosis due to probably greater hemodynamic disturbance with this technique and concurrent use of vasopressors like ephedrine. Spinal hypotension and fetal acidosis have not shown to be associated with any adverse outcome in healthy term babies, but it may not be true in cases of compromised fetuses. Dyer and coworkers compared general anesthesia (GA) with SA in preeclamptic women with nonreassuring fetal heart trace (FHR) pattern and reported better neonatal outcome following GA. The data comparing relative effects of types of anesthesia on cord blood gases of neonates with nonreassuring FHR in healthy maternal population are limited. A low-dose spinal anesthesia (LDSA) is defined as the use of hyperbaric spinal bupivacaine in low dose of less than or equal to 8.0 mg. The standard conventional dose for spinal anesthesia is defined as the use of hyperbaric spinal bupivacaine more than 8.0 mg. The current literature suggests using a LDSA with opioids like fentanyl, which reduces the incidence of hypotension while providing adequate surgical block. ,, Also, best maternal (no nausea) and fetal (higher umbilical artery pH) outcome have been reported with the maintenance of blood pressure using phenylephrine. However, till date, use of phenylepherine has not been studied in emergency CD indicated for acute fetal compromise. We designed this study to compare the effects of GA or a LDSA on neonatal outcome in women undergoing emergency CD for nonreassuring fetal heart rate. Our primary outcome variable was umbilical artery (UA) blood gas base excess (BE) >8 meq/L. In secondary outcome measures, we studied episodes of maternal hypotension and the number of phenylephrine boluses required. Neonatal assessment was done using Apgar scores and need for resuscitative measures. This pilot study was conducted after approval by the Institute Ethics Committee (MS/177/RES/23027) and written informed consent of 30 ASA 1 and 2, laboring parturients undergoing emergency CD category 2 indicated for a nonreassuring FHR. The patients were divided into two groups of 15 each to either receive GA (GA group) or LDSA (LDSA group). Inclusion criteria for nonreassuring FHR was a rate of <100 or >150 beats/min saltatory variability, variable decelerations with nonreassuring FHR and late deceleration with preserved beat to beat variability. Exclusion criteria included patient's refusal, any contraindication to either GA/SA, parturient receiving sedative drugs during labor, block performance time >15 min, obesity, difficult airway, local or generalized sepsis, cord prolapsed and gestation <28 weeks. The decision to proceed with operative delivery was made by obstetricians independent of the investigators. After a nonreassuring FHR was established, all parturients received intrauterine fetal resuscitation measures till the induction of anesthesia. These included switching off oxytocin, use of full left lateral tilt, oxygen by face mask (40%) and hydration with crystalloid (<750 mL). Women in both the groups received aspiration prophylaxis ranitidine 150 mg and Metoclopramide 10 mg intravenously as soon as decision for emergency lower segment cesarean section (LSCS) was taken. The monitoring included heart rate, continuous electrocardiography, noninvasive blood pressure and pulse oximetry in both the groups, with end tidal capnography in the GA group (Datex Ohmeda Avance 5 multichannel monitor, GE Healthcare, Helsinki, Finland). Systolic blood pressure was recorded every minute till delivery of the baby. A slight left uterine displacement was given to all women predelivery. All the parturient were preoxygenated with 100% oxygen for 3 min and induction of anesthesia was done with intravenous (IV) thiopentone 5 mg/kg followed by IV Suxamethonium 1.5 mg/kg using the rapid sequence technique. Intubation was done and bilateral air entry and confirmed by auscultation. Maintenance of anesthesia was done with FiO 2 of 0.5 in 0.5-1% Isoflurane. Patient's lungs were ventilated to target EtCO 2 concentration of 30-35 mmHg using a circle system with fresh gas flow of 5 L/min till delivery. Neuromuscular blockade was achieved using IV vecuronium bromide 0.1 mg/kg followed by 0.08 m/kg as intermittent bolus when required. Umbilical cord blood samples were obtained from a segment of double-clamped cord soon after the delivery of the baby. Oxytocin 2U and Morphine 0.05 mg/kg iv was administered after delivery of baby and infusion oxytocin 10U/500 ml saline at 60-100 mL/h was started. At the end of the surgery, neuromuscular blockade was reversed and the trachea was extubated. Injection Diclofenac 75 mg was administered intramuscularly for postoperative analgesia. All parturients received 1.6 mL of 0.5% hyperbaric Bupivacaine (8 mg) with 20 μg fentanyl administered at the L 3-4 level in the absence of uterine contractions. Supplemental oxygen by face mask was given till delivery of the baby. An established bilateral sensory block of T 4 was judged by using needle prick every 1 min. If the block height was ≤T 6 and the patient complained of pain any time during the surgery, IV 1 mcg/kg fentanyl was administered as rescue analgesia and the total fentanyl requirement was noted. If the block was ≤T 10 , it was considered as block failure and the patient was administered GA and was analyzed separately. Oxytocin therapy after delivery was given as for the GA group. Neonatal outcome was assessed by a pediatrician blinded to the technique of anesthesia. This was ensured by separating the neonatal resuscitation area from the operative field by a curtain. The following variables were recorded: neonatal weight, umbilical cord arterial blood gases (ABG) and venous blood gases (VBG) (using Bayer Rapid Lab 855 blood gas analysis machine) and Apgar scores at 1 and 5 min. A base deficit of >8 meq/L and a pH value of <7.2 were defined as fetal acidosis. Need for assisted ventilation in the form of facemask ventilation, intubation and ventilation or cardiopulmonary resuscitation were also recorded. Assessment of a neonate at follow-up for the next 24 h included admission to neonatal intensive care unit, any evidence of respiratory distress (using clinical and radiological features) or need for respiratory support, i.e. nasal continuous positive airway pressure (CPAP) or intermittent positive-pressure ventilation (IPPV). The normal value for umbilical arterial base deficit after elective CD is of the order of 5 ± 3 meq/L. It was hypothesized that a mean base deficit of 8 meq/L or more would, therefore, represent a clinically relevant level of acidosis. Assuming an SD of 7.5 and difference of 5 as clinically significant, we required 15 patients in each group with α = 0.05 and power of 90%. The null hypothesis was that the method of anesthesia (spinal or general) will make no difference to neonatal umbilical arterial base deficit in patients with a nonreassuring FHR undergoing emergency CD. The statistical analysis was done using Statistical Package for Social Sciences (SPSS Inc., Chicago, IL, USA version 15.0 for Windows). Data is presented as mean ± SD and median. The Student's t test was used to analyze demographic (maternal age, weight, height, gravida and gestation age) and clinical (onset time, time to reach the highest dermatome level of sensory block and duration of sensory and motor blockade) data. The hemodynamic parameters were analyzed by using two-way repeated measures analysis of variance (ANOVA). A correlation between the use of phenylephrine and neonatal base deficit was performed using regression analysis. Chi square test was used to analyze the incidence of intra- and postoperative adverse events. P-value less than 0.05 was considered as significant. The data was collected over 1 year (2007-2008) from a tertiary care hospital. A total of 34 consenting women were initially enrolled into this trial. Of these, four women had to be excluded due to nonfulfilment of the criteria of delivery within 30 min of information to the anesthesiologist. A total of 30 patients with 15 patients each in both the groups completed the study. Patient characteristics are shown in [Table 1]. In none of the parturients did the SA performance time exceed more than 15 min. No patient reported pain or required supplemental analgesia or conversion to GA in the LDSA group. The time required for induction to uterine incision times was longer by 4.8 min in the SA group as compared with the GA group (P-value = 0.001), but the duration for uterine incision to delivery was comparable (P-value = 0.198). Maternal baseline hemodynamic data were comparable in both the groups. 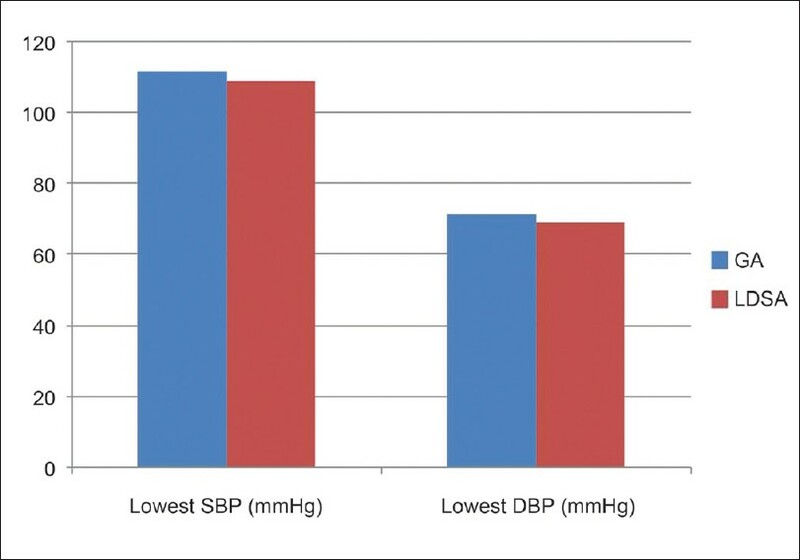 Lowest systolic and diastolic blood pressures were comparable in both the groups [Figure 1]. Only one parturient in the LDSA group experienced hypotension (duration <3 min) and required phenylephrine boluses. The mean neonatal birth weight was lower in the GA group. However, this difference could be attributed to one neonate in the GA group who weighed 900 g. By excluding this neonate, the mean neonatal birth weight was comparable in both the groups, and was statistically not significant. Apgar scores at 1 and 5 min were lower in the GA group (P-value = 0.04 and 0.03, respectively). Results of umbilical cord blood analysis are shown in [Table 2]. 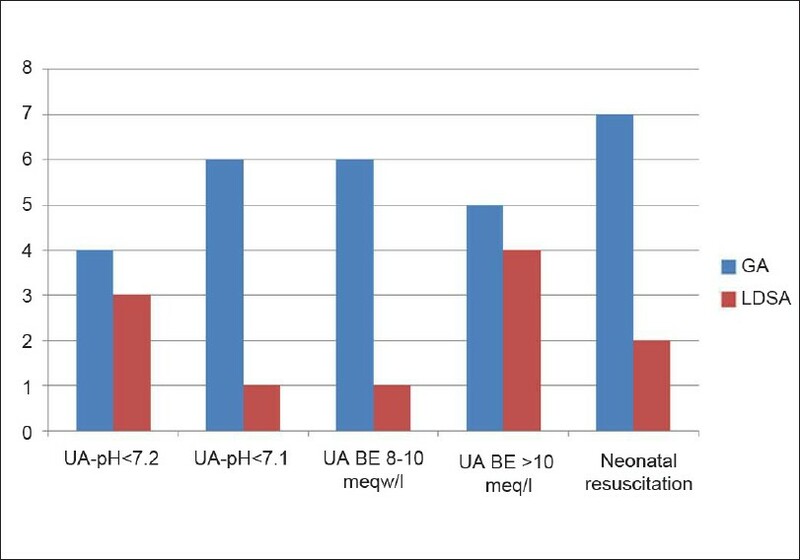 The mean UA pH and BE were higher in neonates in the LDSA group as shown in [Table 2] (P-value <0.05). Eleven neonates in the GA and five in the LDSA group showed cord base deficit >8 [Figure 2]. Neonatal resuscitation in the form of oxygen supplementation with bag and mask ventilation was required in seven (46.7%) neonates in the GA and two (13.3%) neonates in the LDSA groups. Using regression analysis, there was no significant correlation between use of phenylephrine and Apgar score in neonates and use of phenylephrine and neonatal base deficit. All the neonates were healthy and required no oxygen supplementation at 24-h follow-up. Our study showed that GA was associated with greater base deficit than an LDSA in neonates born to mothers undergoing emergency CD for acute fetal compromise. Further, there was a higher incidence of lower 1-min Apgar scores in this group. Most of the earlier data have examined the effects of anesthesia on neonatal well being in patients undergoing elective CD. ,, There is little work done in situations where there is acute fetal compromise as seen by an abnormal cardiotocograph. In a previous randomized trial in which a heterogeneous mix of patients undergoing nonelective CD was selected, authors reported that actual fetal compromise was present only in 24% of their patients. Also, this study examined the effects of two different vasopressors on fetal acid-base status. In our study, we aimed to find the optimum anesthetic technique in situations of acute fetal compromise. We included parturients with an abnormal FHR without any maternal disease or antenatal diagnosis of fetal compromise. In addition, we recruited in utero fetal resuscitative measures to prevent any further deterioration in fetal status. Because we limited our study to true emergencies, we faced certain logistic difficulties particularly related to the choice of anesthesia. Therefore, as per our usual practice, GA was administered to women at the obstetricians' request depending upon the nature of clinical urgency. Because SA causes hypotension and may decrease uteroplacental blood flow, an efficacious control of hemodynamics is recommended. A dose-dependent decrease in the incidence of hypotension has been reported with 5-7.5 mg Bupivacaine. , There is a concern that lowering the intrathecal dose would reduce the quality of anesthesia and increase the incidence of pain during cesarean section. Therefore, addition of short-acting opioids and a back-up catheter are recommended. We decided to use 8 mg bupivacaine with 20 μg fentanyl intrathecally as this dose has been shown to provide good surgical anesthesia without any adverse effects. In our study, we did not observe any breakthrough pain, nausea, vomiting or requirement of rescue analgesia. Langesæter and coworkers used an LDSA with 7 mg bupivacaine and sufentanil and reported stable hemodynamics during elective CD. However, a catheter back up was used and three of 40 patients required epidural supplementation. According to the recent review article, an LDSA should be used with a back up epidural catheter in place to rescue the block if anesthesia is inadequate or becomes inadequate during surgery. This may be difficult in emergency CD due to time constraints and an untested or not correctly sited epidural catheter as compared with single shot SA might be speculative. As our sample size was small, we did not encounter any failure and hence the possibility of break through pain or prolonged surgery warrants further studies using conventional doses and liberal use of phenylephrine. We decided to target an absolute value of 100 mmHg for maintaining SBP. A tight control of maternal BP by using a prophylactic infusion of phenylephrine gives best maternal and fetal outcome. In our study, women were laboring and therefore obtaining a baseline value in these cases is not feasible. Only one mother experienced hypotension in the LDSA group that required treatment. The duration of hypotension in this patient was also short (<3 min). Studies have shown that such short duration of hypotension does not change the fetal acid-base values. In our study, we attempted to maintain SBP >100 mmHg by using an LDSA and administering 30 μg phenylephrine boluses every minute till SBP >100 mmHg. A dose of 30 μg Phenylephrine was lower as compared with doses of 50-100 μg by Ngan Kee and coworkers as they have reported reactive hypertension and bradycardia more frequently in their patients. Additionally, the use of LDSA is associated with a 22% reduction in maternal hypotension, and laboring women experience fewer episodes of hypertension as compared with nonlaboring women. , Allen and coworkers have used Phenylephrine in a dose of 25-50 μg/min and found greater maternal hemodynamic stability than 75-100 μg/min in elective CD. Therefore, we used lower doses of Phenylephrine in our parturient. We did not observe any episode of vomiting or nausea in this study. Higher incidence of nausea and vomiting has been seen with the use of ephedrine. Authors opined that, probably, phenylephrine restores blood pressure faster than ephedrine and is thus related with no maternal nausea or vomiting. In conclusion, this study reports higher metabolic acidosis and low Apgar scores with GA in neonates with nonreassuring FHR pattern. An LDSA offered hemodynamic stability and higher UA base deficit. The possibility of breakthrough pain and absence of back up catheter should prompt further studies using conventional doses of spinal and prophylactic infusions of phenylephrine. 1. Mc Cahon RA, Catling S. Time required for surgical readiness in emergency caesarean section: Spinal compared with general anaesthesia. Int J Obstet Anesth 2003;12:178-82. 2. Lee A, Ngan Kee WD, Gin T. Prophylactic ephedrine prevents hypotension during spinal anaesthesia for caesarean delivery but does not improve neonatal outcome. Can J Anaesth 2002;49:588-99. 3. Dyer, Els I, Faebas J, Torr GJ, Schoeman LK, James MF. Prospective Randomized trial comparing General with spinal anaesthesia for caesarean delivery in pre-eclamptic patient with non reassuring fetal heart trace. Anaesthesiology 2003;99:561-9. 4. Arzola C, Wieczorek PM. Efficacy of low-dose bupivacaine in spinal anaesthesia for caesarean delivery: Systemic review and meta-analysis. Br J Anaesth 2011;107:308-18. 5. Ben David B, Miller G, Gravriel R, Gurevitch A. Low dose bupivacaine-fentanyl spinal anaesthesia for caesarean delivery. Reg Anesth Pain Med 2000;25:235-9. 6. Choi DH, Ahn HJ, Kim MH. Bupivacaine sparing effect of fentanyl in spinal anaesthesia for caesarean delivery. Reg Anaesth Pain Med 2000;25:240-5. 7. Jain K, Grover VK, Mahajan R, BatraYK. Effects of varying doses of fentanyl with low dose spinal bupivacaine for caesarean delivery in patients with PIH. Int J Obstet Anesth 2004;13:215-20. 8. Ngan Kee WD, Khaw KS, Ng FF. Comparison of phenylephrine infusion regimens for maintaining maternal blood pressure during spinal anaesthesia for caesarean section. Br J Anaesth 2004;92:469-74. 9. Ngan Kee WD, Khaw KS, Lau Tk, Ng FF, Chui K, Ng KL. Randomised double blind comparison of phenylephrine vs ephedrine for maintaining blood pressure during spinal anesthesia for nonelective caesarean section. Anaesthesia 2008;63:1319-26. 10. Langesæter E, Rosseland LA, Stubhaug A. Continuous invasive blood pressure and cardiac output monitoring during caesarean delivery: A randomized, double-blind comparison of low -dose versus high-dose spinal anesthesia with intravenous phenylephrine or placebo infusion. Anesthesiology 2008;109:856-63. 11. Levy BT, Dawson JD, Toth PP, Bowdler N. Predictors of neonatal resuscitation, low Apgar scores, umbilical artery pH, among growth-restricted neonates. Obstet Gynecol 1998;91:901-16. 12. 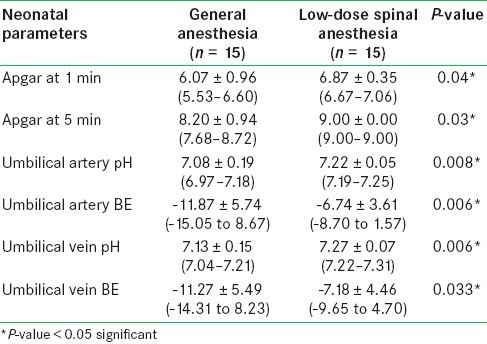 Roofthooft E, Van de Velde M. Low dose spinal anaesthesia for caesarea section to prevent spinal-induced hypotension. Curr Opin Anaesthesiol 2008;21:259-62. 13. Kansal A, Mohta M, Sethi AK, Tyagi A, Kumar P. Randomized trial of intravenous infusion of ephedrine or mephentermine for management of hypotension during spinal anaesthesia for caesarean section. Anaesthesia 2005;60:28-34. 14. Allen TK, George RB, White WB, Muir HA, Habib AS. A double blind, placebo-controlled trial of four fixed rate infusion regimens of phenylephrine for hemodynamic support during spinal anaesthesia for cesarean delivery. Anesth Analg 2010;111:1221-9.